Spring has come full-on to Central Florida. When I arrived here this Winter, the plaza, and the plaza adjoining this one, was busy and always full with autos from all-points-North. Each plaza had a sweepstakes Internet gaming cafe. Elderly Snowbirds flocked to these game rooms to spend their winter days and vacation coins. Then the State of Florida Legislature passed a law banning all sweepstakes gaming centers. Citing that these establishments were intentionally fixing the games to take advantage of their patrons, the bill forced them all to close. The cafe next door to this office, The Treasure Chest, closed two weeks before the Governor signed the bill into law. It was eye-opening to watch the old folks count the dollars from their wallets, as they walked to the locked door, determining how much they were going to wager against the odds (which were not in their favor). They would pull on the door handle and finally see the place was locked up tight. Most would pull again, and again, as they read the notice "...remember you forever" taped to the door. The parking lot in front of the office became very empty. The cafe in the neighboring plaza, The Lucky Duck, remained open until the last moment. That parking area was full to capacity. Like a flock of water birds feeding at the the last pond before their Northern migration, they gathered. From the moment the doors opened until late at night they filled their need, and the pockets of the owners of the Lucky Duck. The Duck closed two hours before the Governor signed the bill into law. The line of cars leaving the plaza that afternoon looked like a funeral procession, all eyes despaired from loss. Several days passed as both plazas saw the lingerers driving from plaza to plaza ,up and down the highway, searching for an open door. Within a few days that same highway was filled with motor homes, heading North. Next winter they may discover a different activity.... Perhaps a walk along the edge of a pond, the gulf beaches or an old fashioned game of shuffle-board. A pile of boxes appeared behind the Lucky Duck after they closed the doors. Among the trash was one small dusty rubber lucky duck with the prize winning numeral 500 marked on its underside. 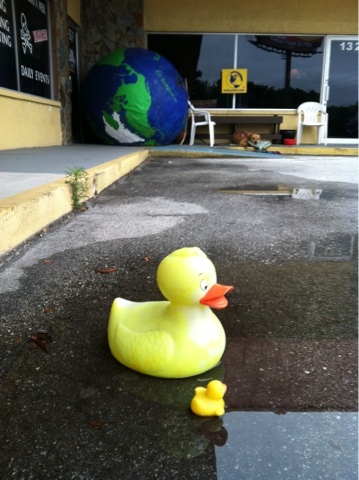 It must have somehow jumped out of the lucky duck pond. An honest mistake.